Another Great Story Party Planned to Celebrate our Community Mitten Drive! All are welcome to join us at a story party on January 31 at 2pm to hear Jan Brett's classic adaptation of the Ukranian Folktale, The mitten, and make Mitten crafts The cost to attend this event is the donation of a pair of Mittens! All will be entred to win a copy of the famous tale just for donating to this worth cause! While this party is free to attend, we do ask that you RSVP so we can plan crafts. Join Children’s Theatre Company for a storytime and activity around Jan Brett’s The mitten, plus enter to win tickets to CTC’s production created specifically for preschoolers, The Biggest Little House in the Forest. Buy tickets today for CTC’s production of The Biggest Little House in the Forest, on stage Feb 3 - March 15. Visit www.childrenstheatre.org for more details! Come celebrate the holidays with NYT #1 bestselling children's author-artist Jan Brett! We are thrilled to welcome Brett back to Spokane to share her newest story, The Animals’ Santa, an original tale about an adorable group of forest animals (including rabbits, a porcupine, ravens, squirrels, and an arctic fox) that try to discover the mystery behind treasures left for them each and every Christmas. Brett has over 39 million books in print and regularly occupies the #1 slot on the New York Times best seller list. Free autographed posters are available for the first 100 families attending. Bring your camera as there will be plenty of photo opportunities with Hedgie the hedgehog and Brett’s decorated tour bus. Fine print: This is a non-ticketed event with a suggested $5 per adult donation at the door which will go directly to Friends of the Bing. Children are free. To be in the autograph line you must have an Auntie’s receipt with a copy of The Animals’ Santa (all of Brett’s books will be available for sale at the event or at Auntie’s Bookstore before hand). Depending on the size of the crowd you may be able to have other books signed as well. For all books that Brett is unable to sign, there will be bookplates (created and signed by Brett) handed out to everyone who needs them. Stand-by tickets will be available on a first come first serve basis on the evening of the event. Join author and illustrator, Jan Brett, for a presentation and signing of her new picutre book, The Animals' Santa. On Christmas Eve Big Snowshoe finds a way to see the animal’s Santa when a Snowy Owl in a red cap, swoops down with a pack full of presents. Never again will an excited Little Snow doubt that there is an animal’s Santa. 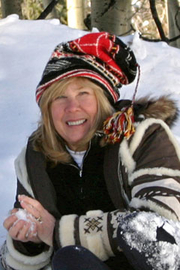 Celebrate winter with Jan Brett, the beloved New York Times bestselling author/illustrator of many books for children. Brett presents the magical story of a little rabbit's first Christmas. After all the forest animals tell him about The Animals' Santa, he is excited to wake up on Christmas morning to find his own surprise. Note: Crowd size will determine if Jan will be able to sign books from home, but bookplates will be available if she is not able to sign all books. Register for this event here! For more information, please contact the St. Charles City-County Library at 636.447.2320. Milford - JAN BRETT visits to sign her new picture book for children of all ages! We are thrilled to be hosting JAN BRETT as she graces us with a presentation, reading, and signing for her brand new picture book Cinders: A Chicken Cinderella Story. Because of the huge interest we expect for this event, we are again partnering with our friends at the Amato Center for the Performing Arts located at the Boys & Girls Club in Milford. Visit their website: svbgc.org for directions, etc. *This is all very recent news, so keep checking this page for details about the signing (do's, dont's, bringing books from home, etc.) as they arrive. Stay Tuned!!! Jan Brett is currently considered a "single author." If one or more works are by a distinct, homonymous authors, go ahead and split the author. Jan Brett is composed of 15 names. You can examine and separate out names.